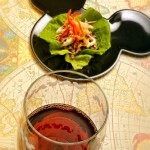 We’re almost through all of the 2010 Epcot Food and Wine Festival booths, but here are a few more food pics to share! 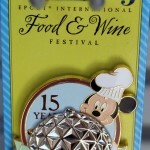 As always, if you want to see full coverage of each booth — including food pictures, menus, and pricing — check out our Epcot Food and Wine Festival Booth Pages! Just click on any booth Country name for detailed information — they’re being updated daily. 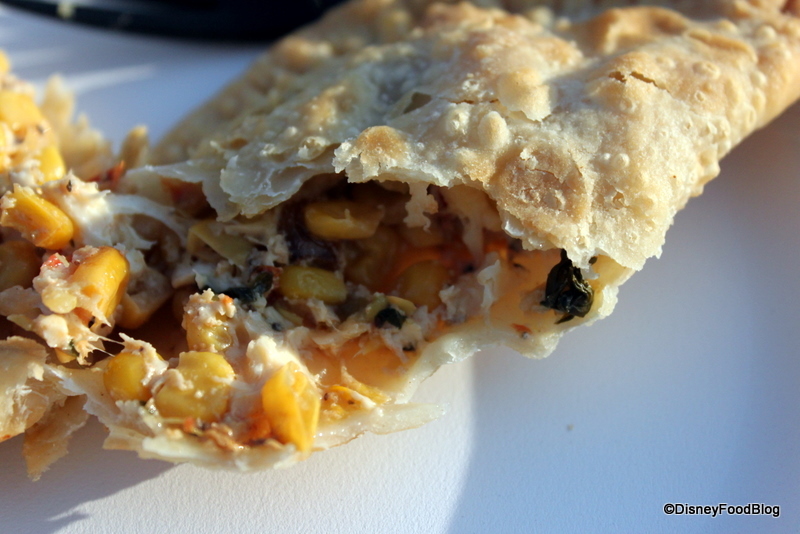 Argentina’s roasted corn and cheese empanada smells incredible and tastes even better. So far, it’s one of my winners from the festival! You can see more pictures, the full menu, and prices on our Argentina Booth Page! 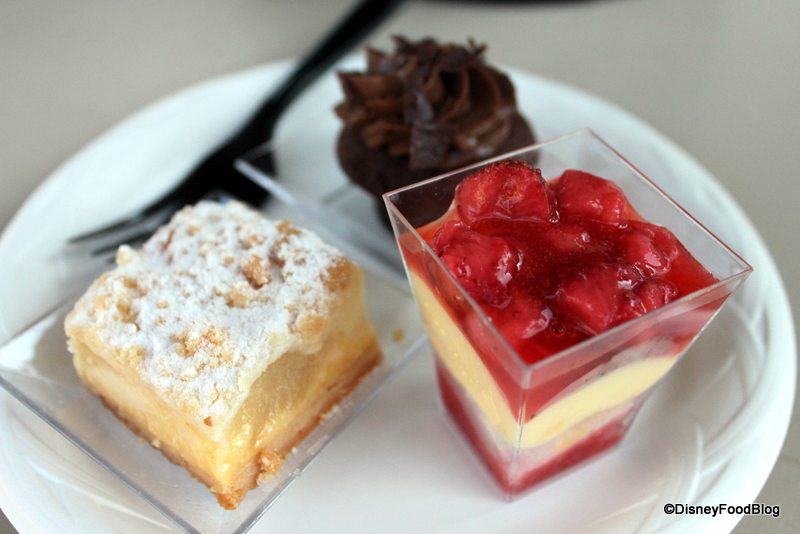 You can find the full menu, prices, and more pictures on our Desserts and Champagne Booth Page. 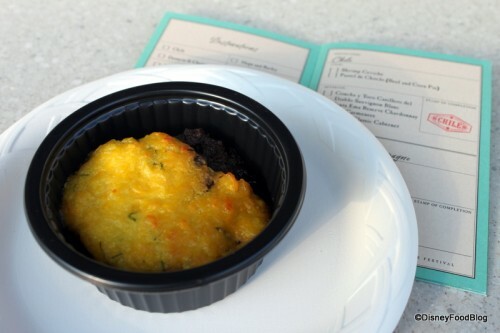 Chile’s new addition this year, the Pastel de Choclo (Beef and Corn Pie), has sweet and savory flavors that will surprise most palates! It’s definitely not what I was expecting. I’d love to hear from some of you who’ve tried it! 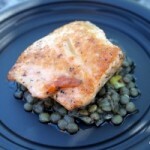 Check out more photos, the full menu, and pricing on our Chile Booth Page. See you at the Festival!! 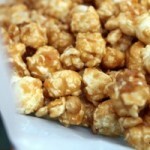 Until then, feel free to check out more food pictures on our booth pages! How wide is that bowl of pastel? From my perspective, that looks like the tiniest, more rinky-dink looking preparation I’ve ever seen. Also, is that dark edge at 1 o’clock burnt? That empanada sounds delish! I’ve been to Buenos Aires but never found a cheese and corn one before. Next time I go back I’ll look harder. I wish I could have some of that dark chocolate sensation! 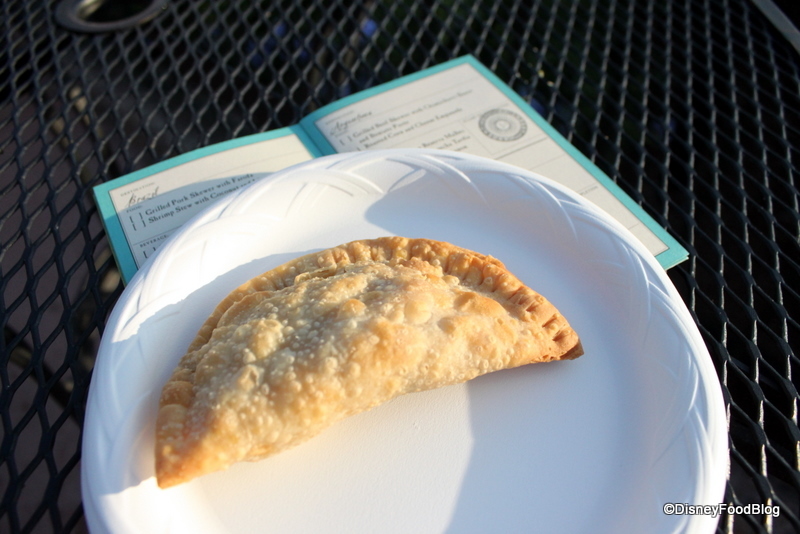 The Roasted Corn and Cheese Empanadas are *so* good! One of my very favorite bites from the festival. They’re also very kid friendly. Carolyn and DVCMom — It was wonderful! A touch of cilantro, which I don’t like, but the other flavors made up for it! I live in Chile, and I love pastel de Choclo. That one does look a little small. Last year they served arepas, which are not chilean at all. Pastel de choclo is very authentic. Does the empanada have beans? I hope not, but it looks like it might. The Strawberry Angel Verrine from the Desserts and Champagne booth looks really good. 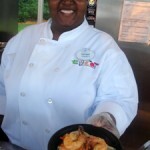 Rhonda — Thanks for the feedback! Melissa — I don’t think it does, actually. Be sure to check, though! I wanted to get that dessert trio all week, but we had free dining and i wanted to maximize my value for it. Plus, the timing just was never right! The beef skewers (in Argentina) were one of my favorite things I ate all week.